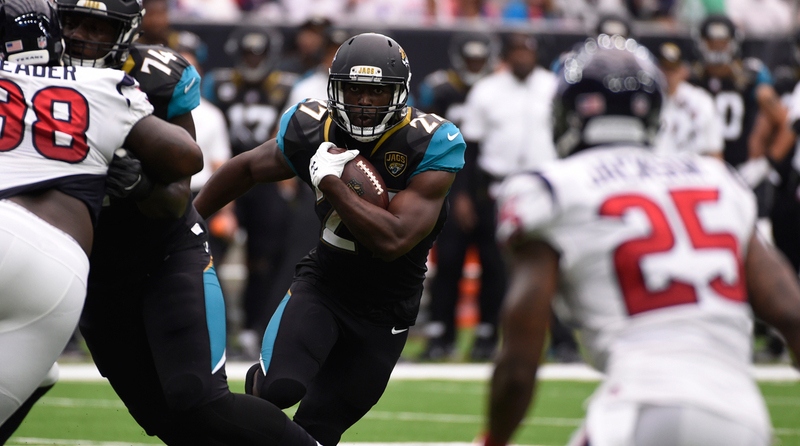 Leonard Fournette and the Jags played with physicality in their Week 1 win over the Texans. You may have noticed my affection for up-downs last month. So it’s my distinct pleasure to tell you: They worked! Alright, I’m exaggerating. But the truth is the up-downs—a required part of new coach Doug Marrone’s program in Jacksonville—were a micro piece of a macro camp theme to get tougher and more physical. That’s exactly what the Jaguars were last Sunday. They blew up the Texans offense for a staggering 10 sacks, and rushed for 155 yards on 39 carries. Blake Bortles threw it just 21 times. Which is pretty much how Marrone and vice president Tom Coughlin drew it up when that whistle blew and all those professional football players had to hit the deck and pop back up like they were 14 again. “It was a punishment in college,” 31-year-old defensive Calais Campbell said with a laugh over the phone Wednesday night. “In high school, we did them to get in shape and stuff, so I guess it was high school the last time it was a workout. Yeah, the first time the up-downs came about here, I was shocked. It was definitely a surprise, I thought they were joking. So here’s our lesson heading into Week 2: September is too early to declare success, but not for judging philosophical change. After the Jags pasted the Texans 29-7, it’s clear that Jacksonville has taken on the personality of its coach, which is a good sign to show at this early juncture. Another showed up when the Texans went no-huddle early, thinking they could wear out the Jaguars. The opposite wound up happening. Jacksonville’s relentless pass rush and pounding run game wound up pushing Houston to its limit. In the process, Campbell wound up with a career-high four sacks, which he attributes to Malik Jackson, Dante Fowler, Yannick Ngakoue and rest of the rushers around him. The win sets up a chance for the Jags to start 2-0 in the division, with the Titans looming Sunday. It’s just one game at this point, and even a victory over Tennessee wouldn’t assure Jacksonville anything. But the way it looked against Houston is enough to at least makes these guys think about what could be next. And that is all Marrone and Coughlin have been asking them to do.